If an employee is absent, you can add time off / PTO by going to the Timesheet, clicking “Actions”, then choosing “Add time off”. 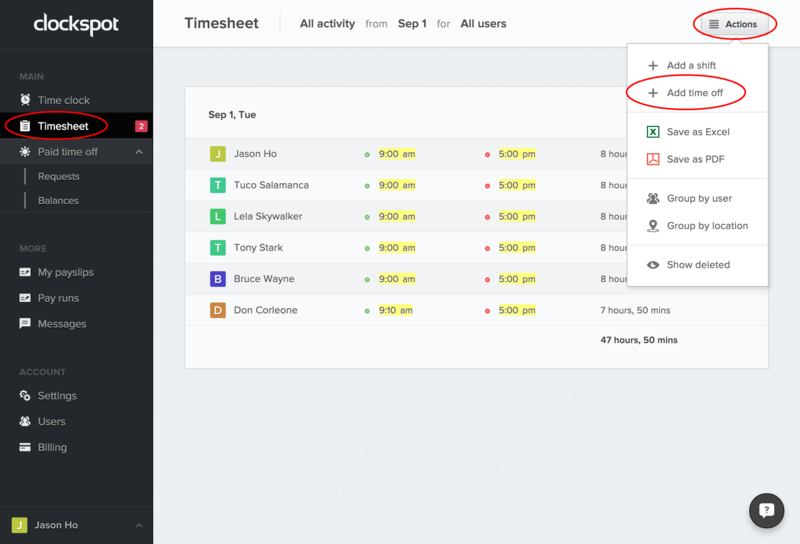 Here you can select the users and dates you’d like to add time off for, as well as select the time off type, and how many hours the time off counts towards. If the time off is unpaid, we recommend that you create a time off type that doesn’t count towards pay. You can add a new time off type by going to Settings > Time off types, then clicking “Add time off type”. Make sure to uncheck the “This time off type is payable” option. You can check your PTO balances by going to “Paid Time Off” > Balances using the left menu. Here you also have the option to set up automatic accrual.